We know what it takes to run a successful concrete leveling business. We show you the way to reduce the risk and go straight for the rewards, so we won’t just send you off with an equipment package and a handshake! 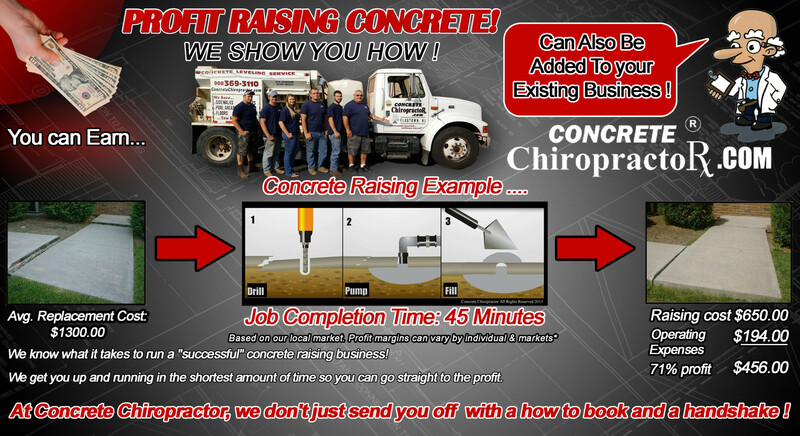 At Concrete Chiropractor, we know you are seeking a profitable and successful business opportunity. One that you can say you proudly own in front of your family and friends. We have committed the last 15 + years of our time, along with hundreds of thousands of dollars pioneering and duplicating our well established name and business system. Whether your considering a concrete raising business opportunity as an initial start up, or as an add on to your existing business to increase profits, by joining Concrete Chiropractor, you’ll receive the best support possible. Learn More About This Unique and Profitable Business Opportunity! And many other related businesses!